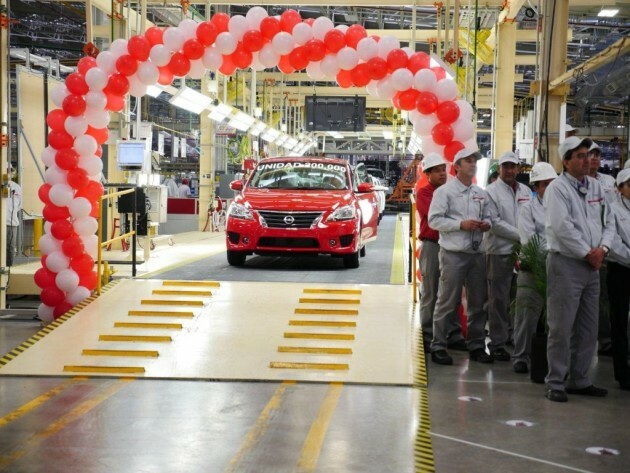 The red Nissan Sentra you see above is the 200,000th vehicle to roll off the assembly line at Nissan‘s Aguascalientes A2 plant in Mexico, and it’s headed for Chicago, Illinois. The plant opened just 16 months ago and assembles a Sentra every 55 seconds. Once completed, these vehicles make their way to the United States, Brazil, or Puerto Rico. Since it opened, the plant has used over 80,000 tons of steel, 1.2 million liters of paint, and 239 million automotive parts over 6.6 million working hours. The Sentra is in high demand right now, with sales in Canada increasing by 16.4%, 24.4% in the United States, and over 110% in Brazil. The Sentra is also assembled in Japan, China, Malaysia, Russia, Taiwan, Thailand, and the US. Truly a worldwide car, it also goes by the name of Pulsar and Sylphy in other markets. The Insurance Institute for Highway Safety gave the 2015 Sentra a Top Safety Pick thanks to its superb crash test performance. Achieving up to 40 highway miles per gallon with the 1.8-liter engine and continuously variable transmission, the Sentra is a high value sedan at its starting price of $16,480 MSRP. With demand this strong, we’ll probably see this plant roll up to 1,000,000 cars in no time.